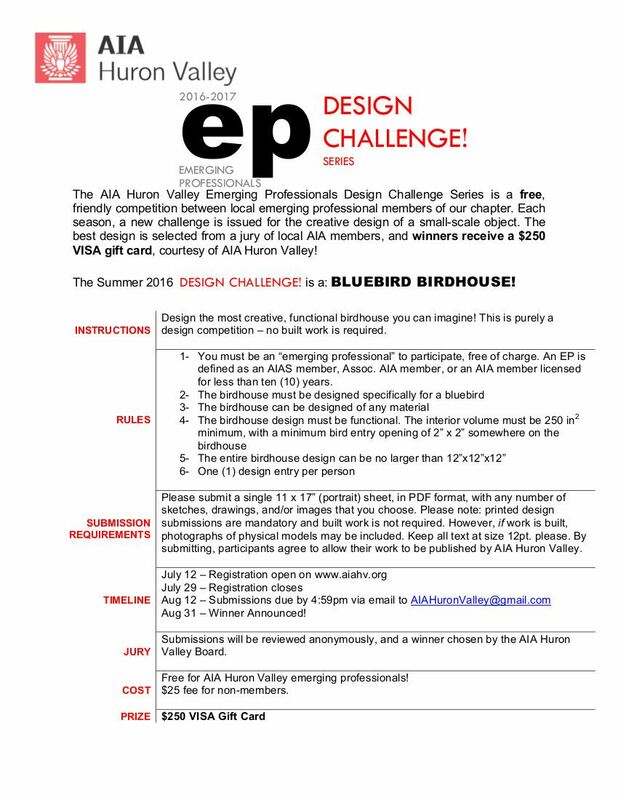 The AIA Huron Valley Emerging Professionals Design Challenge Series is a free, friendly competition between local emerging professional members of our chapter. Each season, a new challenge is issued for the creative design of a small-scale object. The best design is selected from a jury of local AIA members, and winners receive a $250 VISA gift card, courtesy of AIA Huron Valley! The Summer 2016 DESIGN CHALLENGE! is a: BLUEBIRD BIRDHOUSE! Registration opens now, and the deadline to register is Friday, July 29. Final birdhouse submissions are due on Friday August 12.